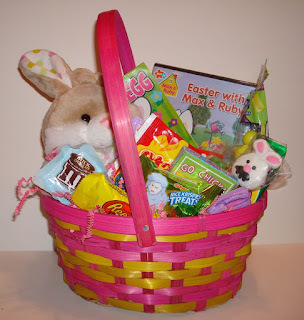 Easter basket filled with candy and toys a perfect Easter basket for kids. If you are looking for a cute Easter basket for kids that hastoys in it , not just candy this is the perfect Easter basket. This will work whether you are looking to buy an Easter Basket for boys or girls. This is just a selection of the candy in each of these kids Easter baskets. There is over 20 pieces of candy that kids love. Not a ton of candy, but just enough to satisfy their sweet tooth. Our candy and toy Easter basket will delight any child. What more do kids like then candy and toys. Buy one of our Easter basket for any child on your list. Gift bagged and you can add your own special message and have it delivered right to your door.